It is Thursday morning and time to get this column written. Time goes so fast from week to week. How can it be Thanksgiving Day next week already? We will be hosting the Thanksgiving meal here for sisters Verena, Susan, Emma and Jacob and families, and our family. We four sisters get together every year on Thanksgiving Day unless there are other plans. We all exchange names for Christmas. We are a total of 25 now. We usually set the table for all of us which makes a pretty long table already. We will have turkey and all the trimmings. Daughter Elizabeth wants to make all the pies for Thanksgiving this year. She is getting to be a good pie baker. My sisters usually all bring food as well so we end up with lots more food then we need. My husband Joe and the boys are off to work this morning. It’s a little rushed on the mornings they all leave around the same time. Getting all those lunches packed and water jugs filled with water and ice takes time. I also make coffee for Joe and nephew Henry to take along in a coffee mug. Our sons don’t drink coffee. Joe and I are the only ones that do. Mose and Susan like tea instead. I remember my mother would have a cup of warm tea by all our plates for breakfast sometimes. Our children drink iced tea better than warm tea. They would also choose hot chocolate over tea in the cold winter mornings. I put a salad in Joe’s lunch today. It’s hard to keep up with who likes what in their lunch. Son Benjamin always wanted ham sandwiches. One day he was so tired of ham and didn’t want any more. I started making burrito wraps and then that didn’t sound good any more. If they don’t have a way to heat up food it’s hard to think of what to put in their lunch. I heat up soup once in a while and put it in a thermos to keep it warm. It’s easiest packing your own lunch because you know what you are hungry for more than anyone else. Son Kevin, 12, packs his own school lunch every morning. Yesterday my daughters and I spent the day at daughter Elizabeth’s house. They will be hosting church services in January or February so she is getting her closets cleaned and organized already. She has two spare bedrooms on the main level that they mostly use when they have overnight company. The one bedroom she does use for her sewing room as well. She has those two rooms cleaned. We helped her clean out the closet in the hallway area. Son-in-law Timothy put up three shelves in it so she can put all her cleaning supplies, rags, brooms, stock pots, etc. in there. We turned the laundry room she had into a baby room for Abigail. We moved the changing table, dresser and all of Abigail’s clothes in there. Timothy had moved the washing machine down to the basement earlier this fall so Elizabeth washes clothes down there now. Abigail’s crib is in Timothy and Elizabeth’s bedroom. I know the feeling that it is nice to have your little one close by during the night hours. I well remember the sleepless nights caring for the children. There are nights when I can’t sleep now waiting until the last one is home. I don’t think a mother every stops looking after her children. The children say, “Mom go to bed, don’t wait up on us.” But until you are a parent yourself you don’t quite understand. I tell them I used to tell my mother the same thing and wonder why she couldn’t sleep until we were all home at night. God watches over us. His blessings to all! 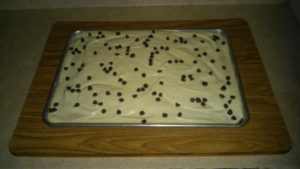 Try this banana chocolate chip sheet cake. It is a new cake we enjoyed this week. I had ripe bananas to use up some way. A great way to use up bananas that are getting older. Preheat oven to 350 degrees. Grease and flour a 10 1/2 x 15 inch sheet pan. Beat together butter and sugar until mixture resembles crumbs. Add eggs, vanilla and mix again. In a separate bowl whisk together flour, soda and salt than gradually add to butter mixture. Add mashed bananas and buttermilk and mix together well. 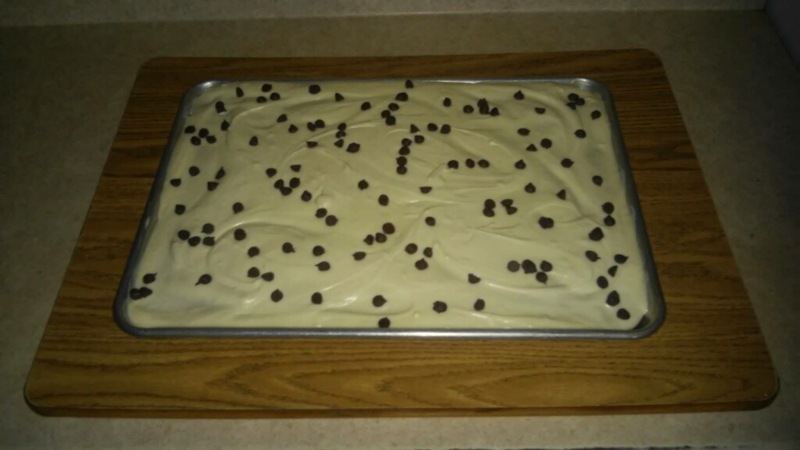 Fold in 2/3 cup of chocolate chips. Bake for 25-30 minutes. Note: Cake is done when corners start to pull back from sides of pan and top of cake springs back when pressed gently in the center. 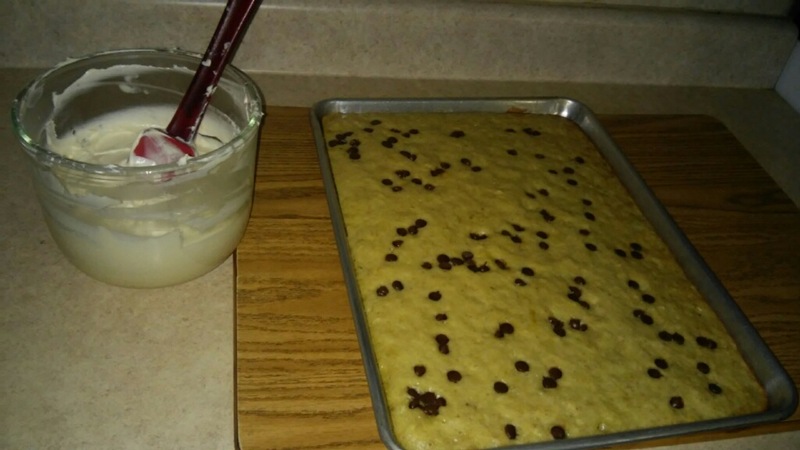 Frosting: Combine cream cheese, butter and vanilla; gradually add confectioner’s sugar and mix until smooth. 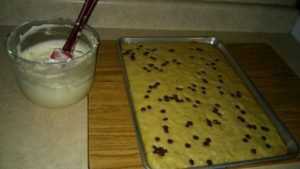 Spread evenly on cooled cake and garnish with chocolate chips. Lovina Eicher is an Old Order Amish writer, cook, wife and mother of eight. She is the co-author of three cookbooks; her new cookbook, The Essential Amish Cookbook, is available from 800-245-7894. Readers can write to Eicher at PO Box 1689, South Holland, IL 60473 (please include a self-addressed stamped envelope for a reply) or at LovinasAmishKitchen@MennoMedia.org.